I’m just going to come right out and say it: as a rule the Southern Italians (from this area at least) don’t know how to cook game. The meat ends up strongly gamey, tough and dry. The only exception to this is ragù di cinghiale which is a rich pasta sauce made with tomatoes, herbs and wild boar meat. 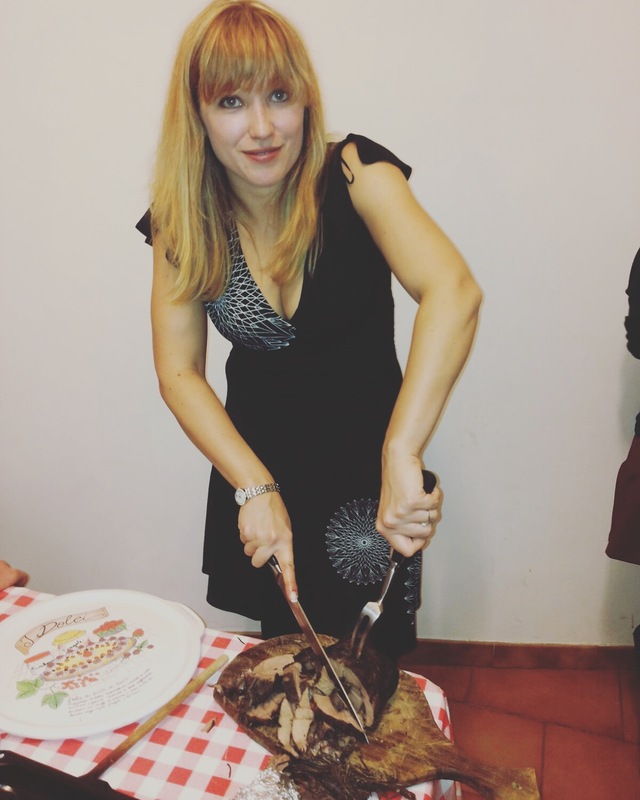 When a friend of mine gave me a leg of wild boar which had already been de-boned, I know I could either make ragù or make it up as I went along. Me being me, I went with the second option and the result was actually delicious – I served the dish at a party and friends of mine who were adamant they didn’t like boar devoured every last scrap on their plates then went looking for more. Lay the boar meat open in an oven tray. Rub with salt and pepper and place rosemary on meat at intervals. Pour the bottle over the meat (I used the whole thing). 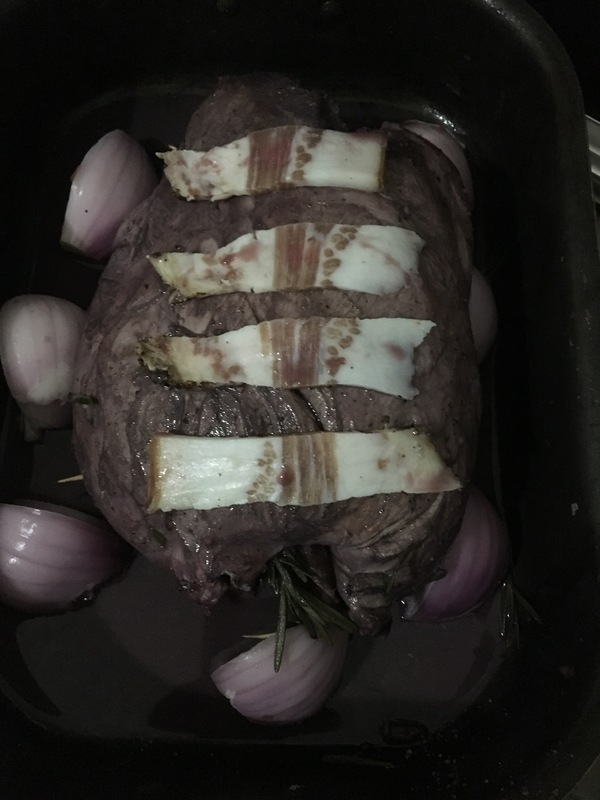 Cover with cling film and place in the fridge for at least 12 hours, turning the meat once halfway through. This is important as it leeches the strong game flavoring from the meat. When you are ready to cook drain the marinade liquid (which will now be cloudy) along with half of the rosemary and place to one side. Lay the meat in the roasting tin and coat the inner side with plum preserve. Add slices of guanciale and the other half of the rosemary. Roll the joint closed and tie in place with roasting string or pin with toothpicks. Seal the meat in a shallow pan over a high flame. Place the meat back in roasting tin with peeled and quartered onions, a good dollop of extra virgin olive oil and more guanciale over the top to provide basting fat as the meat cooks (boar is very lean and without added fat can be quite dry). Ladle a few spoons of marinade over the meat and cover with foil. Place in the oven for 2 hours 30 minutes, checking every half to quarter of an hour after every hour (you know it’s cooked if a knitting needle pushed to the center comes out scalding hot at the tip. You want it to be soft, not over cooked as it would be dry). Add more marinade as necessary. Reduce the marinade in a pan, adding flour as needed to thicken. Once the meat is cooked add the brown from the bottom of the roasting tin and the onions from the pan to the gravy and reduce more if needed. Carve and serve with roast potatoes!